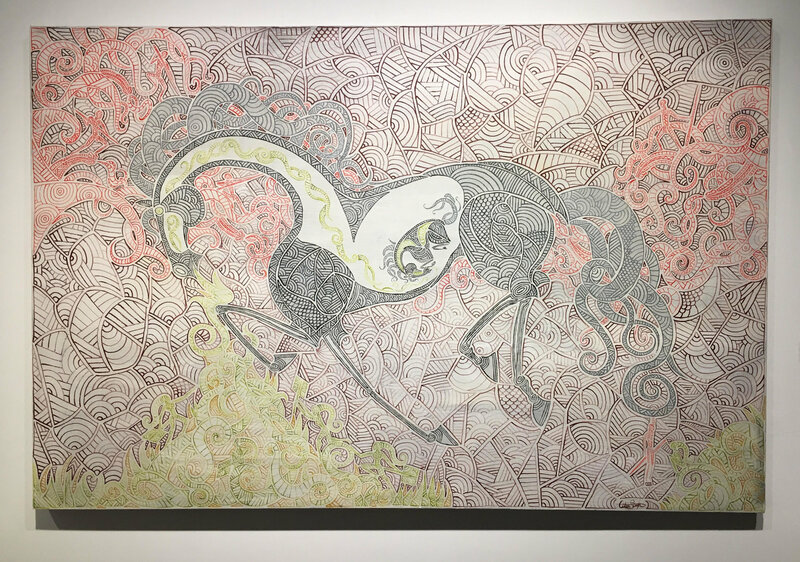 For fourth-year painting majors Jinny Choi, Abby Cochran, Hanna Hentze, Morgan Smith and Oliver Stephens, finding a common thread between all of their works did not come easy. Where some produced their work in a short time span, others explored the themes behind their work over a span of a few years. Where some drew inspiration and materials from nature, others tapped into the personal lives of those around them. “It’s celebrating that differentiation and that variation through that,” said Hentze about the entire body of work. “Our goal was to celebrate the different work and the variation of different mediums and approaches and styles,” said Hentze, a native of Long Island, New York. The thought that all of the varying work, no matter how diverse they may be, comes from the hand is where the name for their group exhibition “From the Hand” came from, and the thread that ties the five of them together. “As we put the exhibition together there were a few things that really connect our work and it was really great to explore that and have that with each other,” said Hentze. 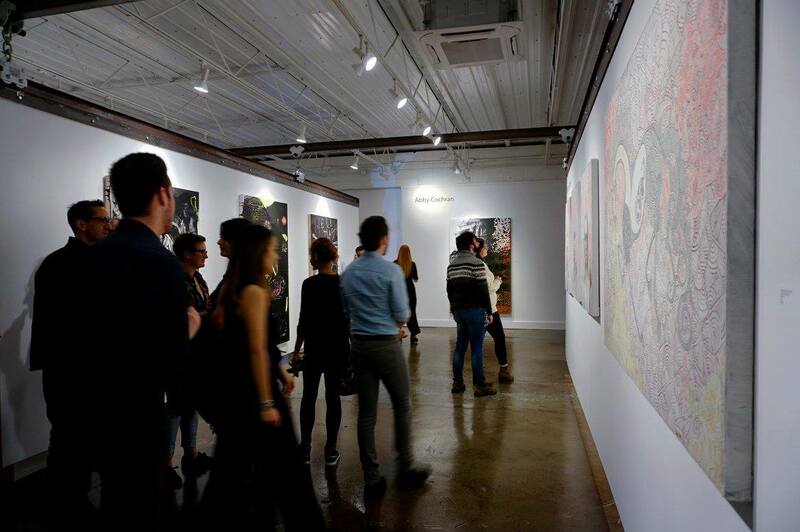 The group banded together for their Exhibition Design As a Practice class to display their works, some of the having been a two or three-year process and for others a few weeks. “We’ve all been head over heels with this project, working day and night on it,” said Smith. “And there were never moments when we got mad at each other,” added Cochran, who’s originally from Indianianapolis, Indiana. Cochran’s abstract artwork was produced in a matter of just ten weeks. “I work very fast. It’s kind of part of my process. The ever-changing always evolving. Because of that, I can work very fastly because I don’t hold myself back and I’m not too concerned with the end result,” said Cochran. 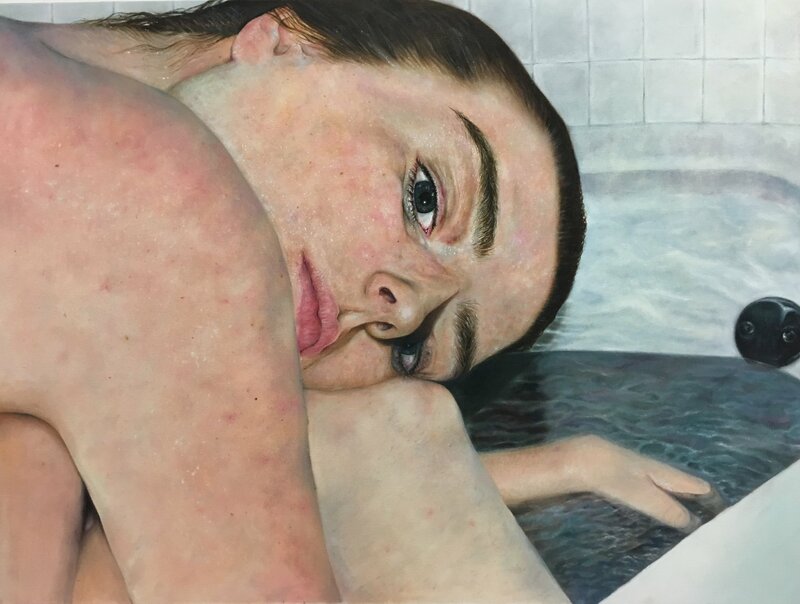 Cochran’s large-scale paintings explore the idea of accepting and rejecting fear, specifically in the realm of mortality and learning to be okay with death. “It’s mostly all about fear and it’s about my lack of fear. 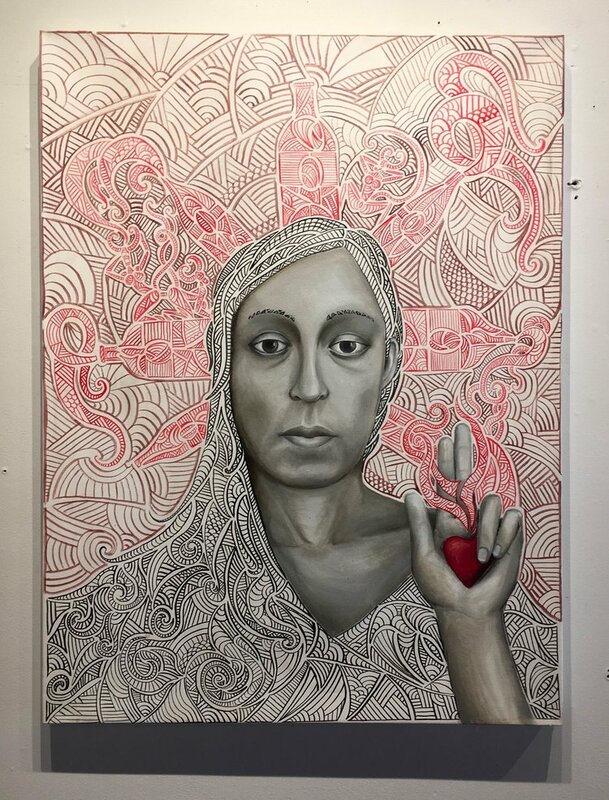 And in a broader sense, I think it’s about our entire societies need to reject fear in terms of politically and in our everyday lives personally,” she said of her paintings. Cochran’s spontaneity allows her to work very fast, throw things onto the canvas and then take things off, always adding and revealing, masking and unveiling. She even goes so far as to paint and play with the area beyond the canvas. 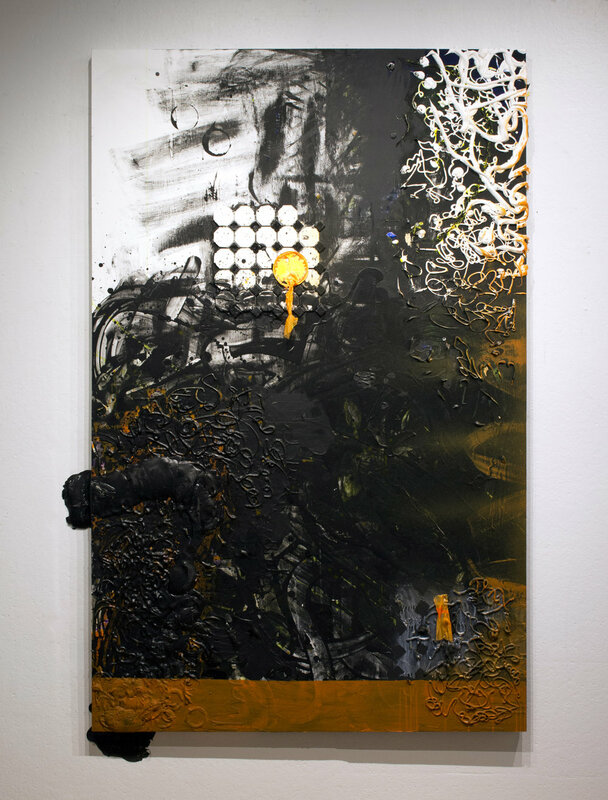 Cochran added nails to one of her paintings creating a shadow on the walls that the paintings are hung on and a glob of black painted that extended off the left side of another painting. 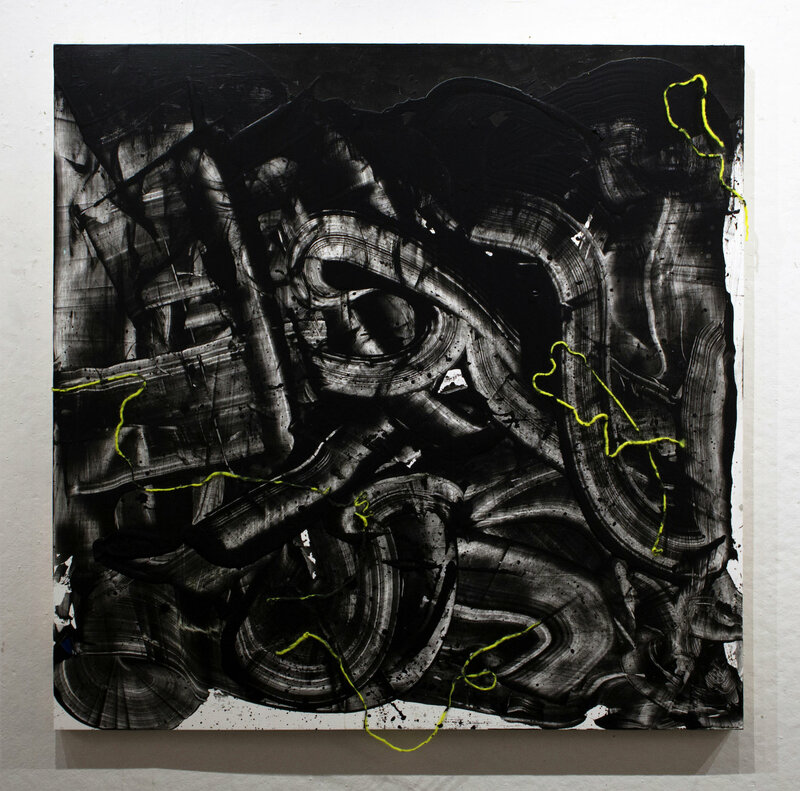 Cochran’s interest is in transforming paintings into something more than just a 2D art form and creating tension and anxiety through her use of shadows. “I deal a lot with a push of pull of light, covering it up and then revealing it,” said Cochran. Hentze’s work, on the other hand, was a much longer, two-year process of exploring water and the relationship of being naked in a vulnerable place such as the shower. “Recently, politically speaking, women’s bodies and the rights of their privacy have been very prevalent,” said Hentze. “So it worked out that I was working with the female figure in an isolated location and having that moment exploited and enlarged and put on view,” she added. Hentze photographed her very close friends, coming in unannounced while they’re bathing or showering and then worked off of those references–in large scale to magnify vulnerability–to create a series of hyperrealistic portraits. “None of them are models none of them are comfortable with being photographed,” she said of the selection of women she painted. Hentze strived to produced a body of work that strayed from the ideal and was more accurate and true of the moment, depicting human vulnerability and the relationship between people and water. Stephens’ body of work has been developed over the past year. Stephen works in acrylic and oil painting, creating patterns and shapes with around black and white portraits. 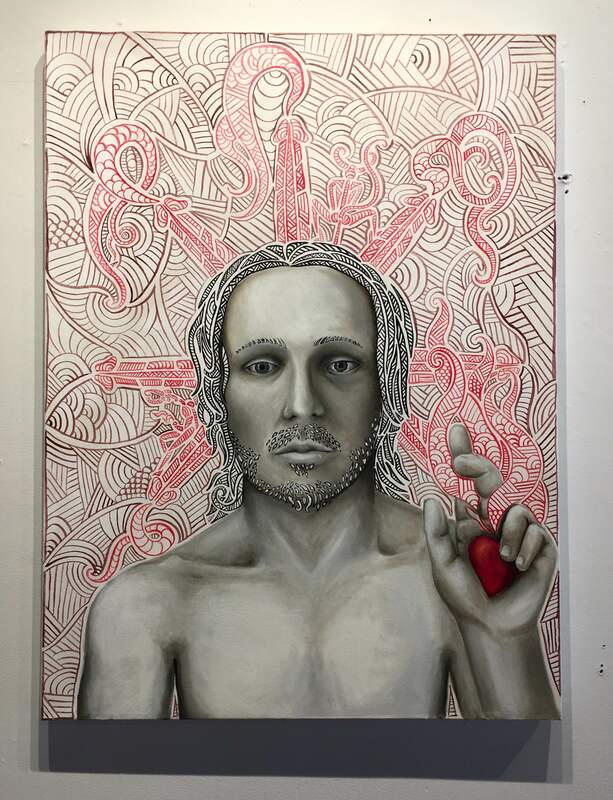 “I would say that this particular style I’m working in is a coping mechanism for me, for certain things that cause tension in my life,” said Stephens, stepping back to take in his work. “For example, this triptych deals with the repression of homosexuality within the Catholic culture. I took myself as well as two close friends whom I know went through the same kind of upbringing,” he said, turning back. “By specifically the catholic culture and how often times the very repression we go through leads to moments of acting out that eventually leads to vices that we are then criticized for by the same exact culture that created those vices, to begin with,” he added. Stephens’ horse piece titled, “Her Body Her Choice,” was inspired by the current political climate and depicts a horse carrying a child. 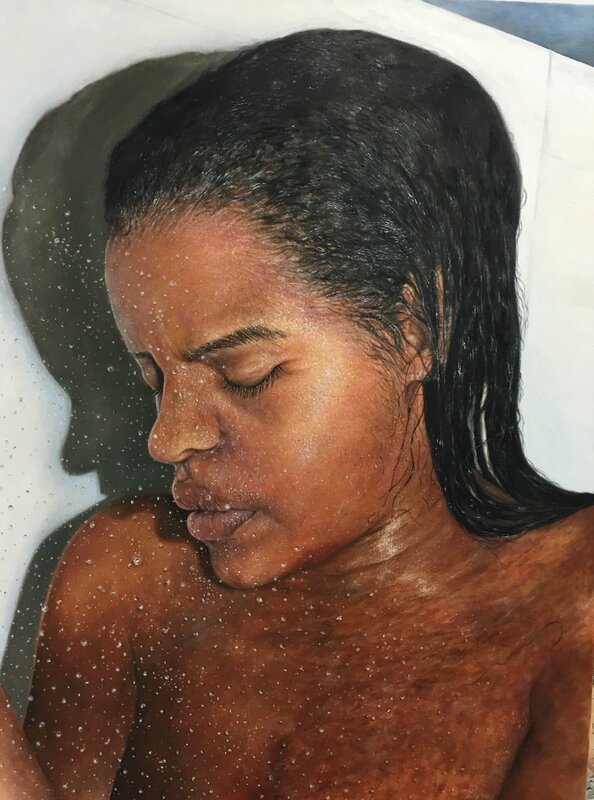 Stephens chose to explore the female body and the idea of choice through the male perspective using oil and acrylic paint. A native of Guatemala, Stephens tries to use materials from home, such as the white in the horse painting which actually came from a pigment used in the colony. Where Stephens explored identity and the human body, Smith explored nature and destruction. Her body of work began after–and was based on–Hurricane Matthew. 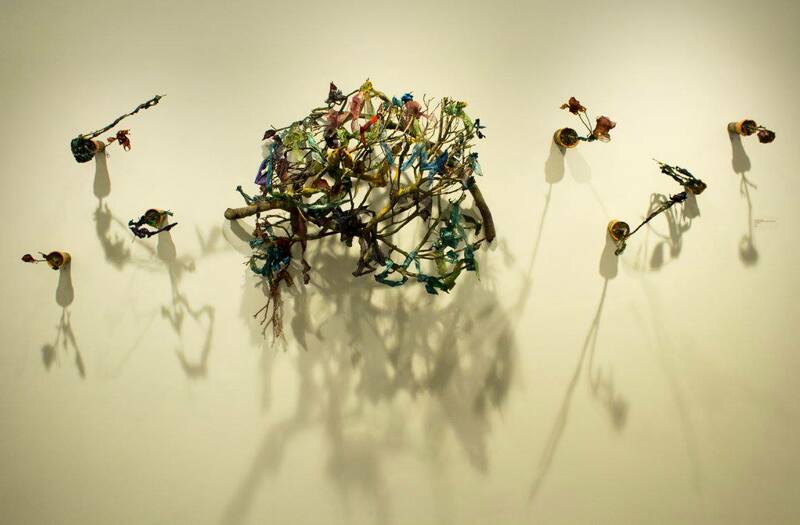 “I like to incorporate things in nature like sticks and trees and all those things,” Smith said of her work. Smith collected found objects, debris, pulling from the mess that Matthew left behind and created very naturalistic and colorful installations. The piece viewed much like a colorful yet oddly ominous memorial to the nature that was destroyed during the hurricane. “It speaks not only to the destruction of nature but also to the overall environment of a location,” said Smith. 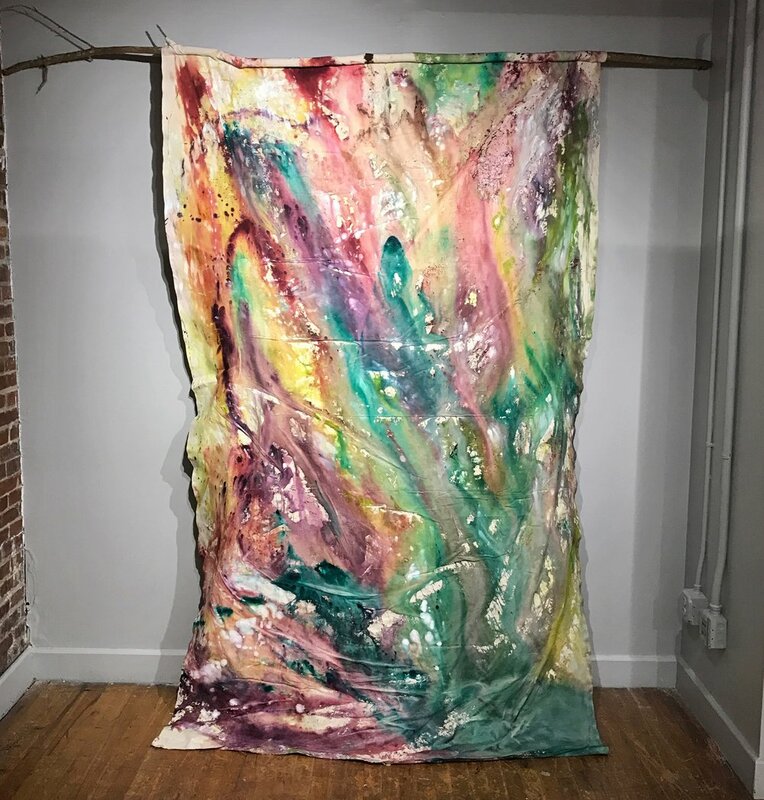 All materials from her exhibit came directly from the environment and paid homage to mother nature and the losses the city has suffered from hurricane Matthew. “We’ll never go back to the same but we make our way around it every day,” said Smith. 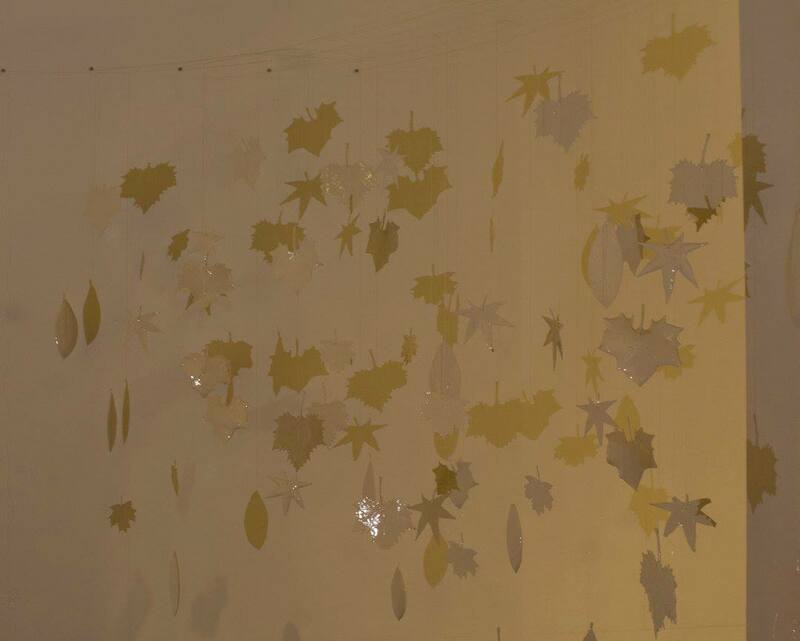 Choi, a native of Seoul, South Korea, slip casted leaves and captured an often fleeting moment in time through her installation. “I wanted to capture the moment of the falling leaves as a symbol of what I think when I’m thinking of time and memory,” said Choi. “By projecting different tones of light, I wanted to communicate that we all have different emotions of the times that have passed. I wanted each one of the viewers to think about them separately,” she added. Choi also projected a video of her performance which consisted of Choi repeatedly tracing her shadow. The work was inspired by the idea of chasing your identity through trying to record your shadow. Each artist had their own unique approach, worked with different materials and practiced varying techniques but no matter what they created, no matter how they exhibited their work, it all came From the Hand. Their exhibition was on display at the Welmont on Friday, March 3 and Saturday, March 4. To read more about their work visit the SCAD painting blog.